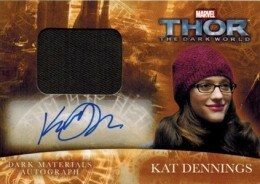 In order to fill out a checklist for a set of cards based on a movie or TV show, a lot of sets use autographs from lesser characters or largely unknown actors that have limited appeal beyond core fans. 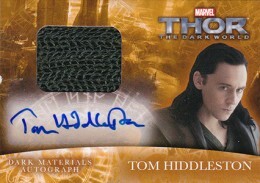 That's certainly not the case with the 2013 Upper Deck Thor: The Dark World Actor Autographs. While the release only has six actors signing, they're all big ones. 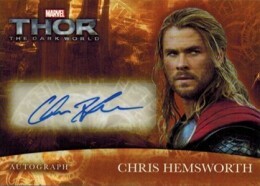 Leading the way is Chris Hemsworth who plays Thor. He has two different basic autograph cards. 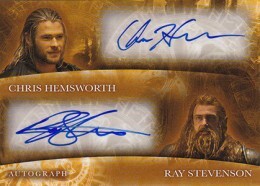 Hemsworth is proving to be a somewhat prolific signer. 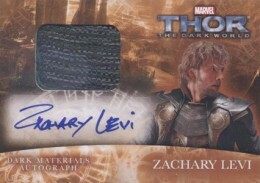 He also has autographs in the set based on the first film, 2012 Upper Deck Avengers Assemble and 2009 Rittenhouse Archives Star Trek. 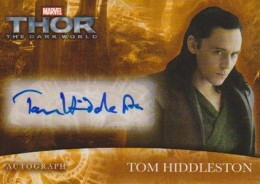 Tom Hiddleston signs again as Loki. 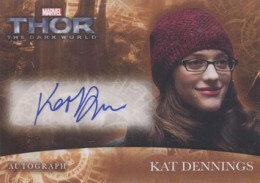 Other Actor Autographs in 2013 Upper Deck Thor: The Dark World include Jaimie Alexander (Sif), Ray Stevenson (Volstagg) and Kat Dennings (Darcy). 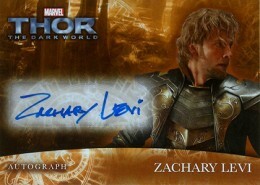 This is the first set to include signatures from Zachary Levi (Fandral), who is best known for TV's Chuck. 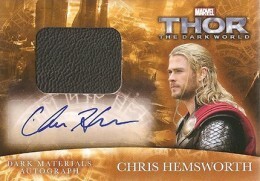 Besides basic autographs, 2013 Upper Deck Thor: The Dark World also has dual autographs and autographed costume cards. These use the same mix of signers. 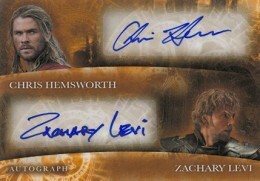 For the dual autographs, all but one feature Hemsworth with one of his co-stars. As impressive as the autograph checklist is, there are a couple of notable names missing, though their absence shouldn't be a surprise. 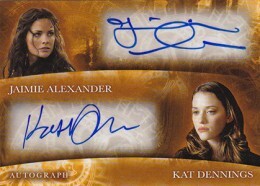 Natalie Portman, Anthony Hopkins and Rene Russo have never signed autographs for a trading card set before. 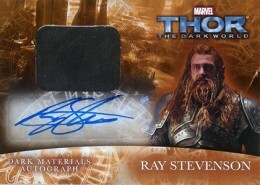 2013 Upper Deck Thor: The Dark World Actor Autographs do use stickers, but they're tough to notice. The stickers are clear and they carefully added to a faded spot that further hides them. Early sales for the cards have been very strong. 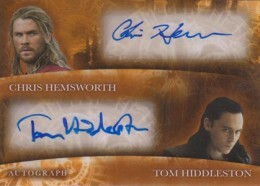 A dual autograph signed by Hemsworth and Hiddleston sold on eBay for $525 on December 14, 2013. 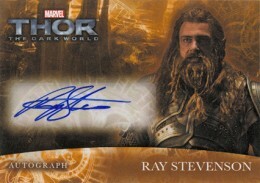 Several other autographs and autographed memorabilia cards sold for more than $400 during the first week of release. In the same time frame, none went for less than $149. 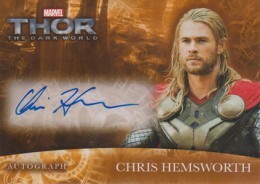 You can see all of the 2013 Upper Deck Thor: The Dark World Actor Autographs below, including dual autographs and autographed costume cards. Click on the card name or image to shop for singles on eBay.